When you think of Aga, what’s the first thing that springs to mind? Is it a dog drying off in front of a warming cooker after a drizzly autumnal walk? An enticing slow cooked stew, tempting all who enter the kitchen? Top quality pans, casseroles and dishes in a variety of rugged materials and gorgeous finishes? If it’s not the latter, then it definitely should be! The Aga Cookshop has created a unique collection of cookware that perfectly complements the iconic cooker. They all feature heavy thermal bases that perfectly conduct the heat from an Aga hotplate, as well as flat lids that allow you to easily stack these items to maximise both oven and shelf space. The company has used different materials to create three distinct kitchenware ranges: Cast iron, cast aluminium and stainless steel. Each material has different unique properties, ensuring that there is a range for every price range, taste and kitchen. And best of all, they can be used on most heat sources, not just the AGA! The Aga Cookshop is synonymous with cast iron cookware, which is not surprising as variations of the company have been creating cast iron cooking pots for longer than the company has had its name! The Aga was only invented in 1922, but a handwritten patent held in the Record Office at Kew granted Abraham Darby I (the first owner of what was to become the Aga Cookshop) the sole permission to create cast-iron pots all the way back in 1707. The company began making these items at the Coalbrookdale Foundry in Shropshire, and to this day the Aga Cookshop still have their cast iron goods manufactured at the same place using these three hundred year old methods. This range is the perfect choice for those who love to cook hearty homemade meals but hate washing up. They are enameled in stunning colours such as the striking claret, which means that you will be happy to serve your meal in these pots and dishes (saving on dishes! ), and they will keep radiating heat whilst on the table so the food should still be warm for seconds. 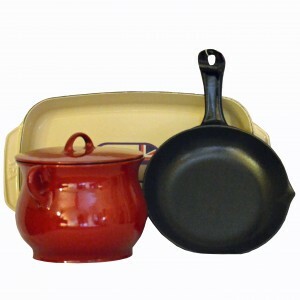 The cast iron casserole and baking dishes are also ideal for slow cooking beautiful stews and joints of meat, as the heat accumulates in the iron and slowly radiates it out, so you can use lower heats than usual. The cast aluminium range is an excellent choice for cooks who are looking for lightweight, non-stick, innovative cookware. It is expertly manufactured in Berndes, and lives up to the German reputation for skillful engineering! 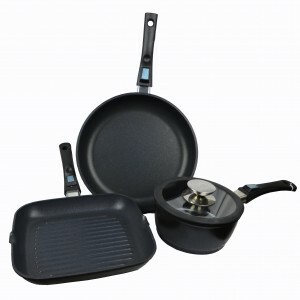 Each item comes with a three layer, Teflon® Platinum Plus non-stick coating both inside and out. This innovative coating is so efficient that it will make cooking with less oil and fat part of your life, and is also supremely easy to clean. Additionally, these layers are scratch resistant, so the pans should retain these excellent non-stick qualities through rigorous use (although we do recommend that you only use wooden and plastic utensils to help prolong these layers). However, the best part of these saucepans is not their lightweight construction or excellent heat conduction qualities (although these are superb! ), but the sleek and sturdy removable handles that can be found on the saucepans, frying pans and grill pans. They give the range added versatility, as you can easily transfer your food from the hob, to the oven and back again if required. It means you can brown the outside of your meat, before popping it in the oven to cook to perfection. And finally we come to the stainless steel range. Made in Switzerland from high quality stainless steel, this range is perfect for the chef who is after cookware that is not only extremely well made, but also has classic looks and clever features. 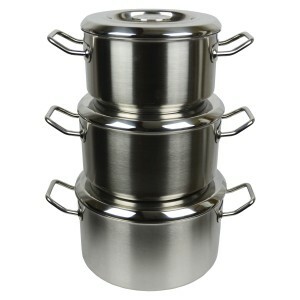 The stainless steel is made with 18 parts chromium to 10 parts nickel, which ensures that these saucepans and casseroles will be part of your kitchen for a long time to come; not only are they extremely difficult to dent or warp (which will help to maintain a hygienic cooking surface), but they are also resistant to rust. They feature heavy 6mm bases with added ‘wave’ technology, so that perfect contact with the heat source is maintained throughout. This not only ensures a consistent temperature, but also helps to increase your energy efficiency. However, my favourite feature of the stainless steel range is the laser etched pint and litre marks that can be found internally in the casseroles, saucepans and stockpot. It’s a clever little addition that is there just to help make cooking simpler! For more information on the AGA Cookshop range, please head on over to www.philipmorrisdirect.co.uk. Aga, Cast aluminium, cast iron, cooking, Cookware, Philip Morris & Son, Stainless steel. Bookmark. Hi. I am about to have an aga installed and am looking for minimal cookware (multifunction) that is both economic and human friendly (not aluminium or coated in chemicals – such as non stick coating are). Something with removable handles would be good. I am not keen on the idea of nickel wither (due to its highly irritant/allergic nature). (In fact I am puzzled why aga products appear to favour theses very products?). Do you have any suggestions as to which cookware would be good/fitting for a modern aga – without the negatives so often seen in cookware please? We would recommend having a look at Le Creuset’s cast iron cookware range, however we cannot guarantee that chemicals haven’t been used during the manufacturing process.